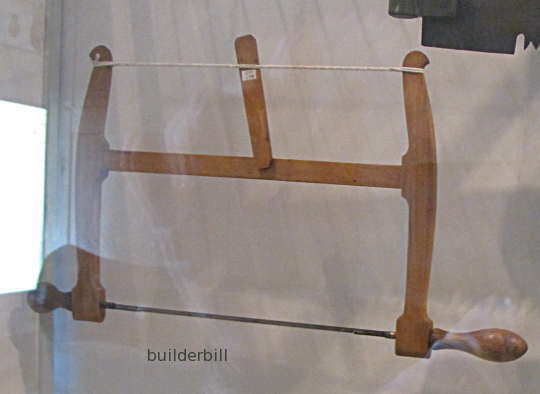 In woodworking, a saw having a narrow metal blade and a wooden frame. Used for curved cuts and also straight crosscut and ripsaw work. These tools are very simple and in many cases the wooden ones are made by their owners. The only thing to buy s the blade. Like a hacksaw or a coping saw the blade can be rotated to suit the work. The blade in the one above is tensioned in the traditional way of tightening two cords with a tourniquet. 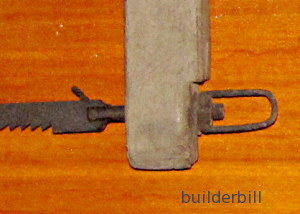 The lever is made to just simply rest against the cross bar when the tension is applied. Modern bow saws seem to be more confined to gardening activities such as lopping tree branches etc. And they are excellent for that. The narrow blade tending not to bind in the cut too much. The modern saws are lightweight tubular steel and are tensioned with a pressed metal lever.